It is a violation to tamper with cable equipment, line connections or hook-up in resident spaces, corridor equipment closets or building equipment closets. Unauthorized use, possession or duplication of University Housing keys or keycards is strictly prohibited. No locks, bolts, chains or other locking devices, besides those installed by University Housing, may be attached to room doorframe. Excessive lockouts throughout the term may be considered harmful to the community. 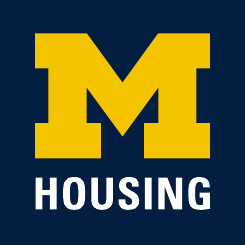 University Housing and the University of Michigan are dedicated to protecting the environment, preserving natural resources, conserving energy, and recycling. As a result, all residents are requested to conscientiously participate in all energy conservation and recycling efforts and to refrain from unnecessarily polluting the environment. This includes, but is not limited to, depositing garbage anywhere other than in dumpsters, depositing recyclable items anywhere but in the appropriate containers; no disposing of oil, grease, gasoline, or other automotive fluids on the grounds, in storm drains, or in plumbing receptacles. Toilets, sinks, and other plumbing fixtures may not be used for any purpose other than those which they were designed for. Solicitors must agree to abide by all applicable laws and University ordinances and regulations while on University Housing grounds. Commercial companies, non-profit organizations, candidates or elected officials, and other organizations are permitted to send representatives door-to-door in Northwood apartment areas from 10 a.m. – 7 p.m. only. If you do not wish to have contact with any solicitor, place a “NO SOLICITING” decal on your outside door. These decals are available at the Community Center front desk free of charge. All solicitors are expected to adhere to this “NO SOLICITATION” posting and not make any contact with the residents of a unit with such a posting. You are encouraged to contact either the Community Center or the Division of Public Safety and Security to report potential violations of this policy. Any individual or organization soliciting within Northwood Community Apartments grounds that violates any term or condition of this policy may be ordered to leave, or be escorted from the premises by DPSS or Housing Security. Individuals or organizations who violate these policies and expectations while on Northwood Community Apartments grounds may be prohibited indefinitely from further activity and may be subject to other actions as applicable under law. Individual residents or groups of residents may invite a commercial vendor to their Apartment for purposes of a commercial solicitation, project demonstration, show, or similar event. Any such solicitation is subject to the Michigan Home Solicitation Act, MCLA 445.111, and et seq. With this type of solicitation, sales may not be consummated at the demonstration site or on the assigned date of the event; residents interested in making purchases may make appointments with sales representatives to do so in their own Apartments at a later date. Residents must be guaranteed three business days to cancel their order with full refund. The Resident space must be used in a quiet, peaceable, and lawful manner for residential purposes only. However, use of the space to conduct a business or commercial enterprise shall be permitted, provided that: a) the space is used primarily as a living place; b) advertisements or signs are not placed on any portion of the inside or outside of the building or related areas which are not reserved for notices; c) conduct of the business does not result in the violation of any other Community Living Standard or University regulation; and d) the business is in compliance with all permits, licenses and applicable laws. University Housing mail rooms are for personal correspondence and packages and not for commercial use.